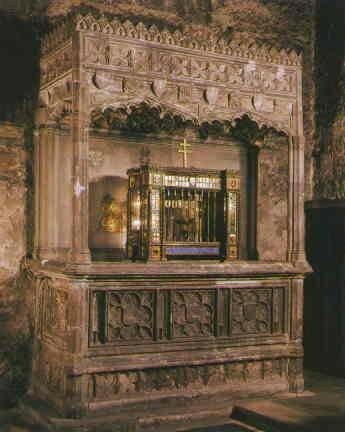 Standing in the Lady Chapel is the altar tomb of Alderman John Croke (1477) which was destroyed by the air-raid of 1940. It has since been completely restored from over 150 fragments. The tomb is made of Purbeck marble, and fine brass memorials at the back of the tomb record the effigies of the Alderman and his eight sons, Margaret his wife and his five daughters. The casket containing the Toc H lamp, given to the movement in 1922 by Edward, Prince of Wales, also contains stained glass shields depicting the arms of places where branches of the Toc H were founded between 1919 and 1929.